App of the Year in the “Books” category in the USA! More than 2 million downloads. Thank you so much! Nighty Night! 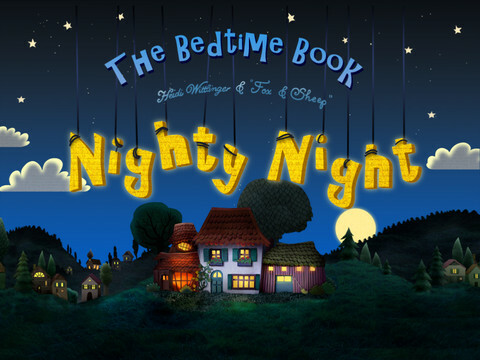 - The interactive bedtime book for children. "Nighty Night!" is the perfect App for a daily go-to-sleep ritual with sweet music and elegant narration. All around the house the lights go out, and even the animals in the barn are tired. But who puts them to bed? Who turns out the lights in their stalls? That is the task for small children aged 1-4. Watching all the animals go to sleep is a lovely way to set the mood for bedtime. "Nighty Night!" is brought to you from Oscar-Nominee Heidi Wittlinger (2002, best animated short) who put a lot of passion and effort in constructing little sets made of paper and combining them with 2D illustration and animation. If you experience any trouble with the App or have any questions or comments, please don't hesitate to contact us any time: contact@foxandsheep.com. We´d love to help you out. Please also mention your device version and your iOS version. If you have any problems with installation or in-app purchase, found bugs, questions, comments about this application, you can visit the official website of Fox & Sheep mobile ventures mv1 UG (haftungsbeschränkt) at http://www.foxandsheep.com. We have fixed some bugs and optimized the App. Happy Holidays to Everyone! Enjoy! Christmas is over and the snowman says goodbye. He is looking forward to see you again next winter!